There are a lot of flashy, innovative, over-the-top games to debut or make a showing at PAX West each year. My favorite of 2018, though, is a relaxing educational simulator meant for both kids and adults, one that portrays the humble but lively world of the common honeybee. Entitled, predictably, Bee Simulator, the game was designed by Varsav Game Studios and led by Polish developer ?ukasz Rosi?ski, who sought to make a game that would educate its audience on the life of a bee while providing a soothing, almost therapeutic, atmosphere for the player to enjoy. Inspired in part by Rosi?ski’s passion for the game Flower, Bee Simulator is the work of a team of 18 developers (10 of whom are women), with a lilting orchestral soundtrack mixed by Steve Kempster (an industry veteran who has worked on everything from Abzu to The Banner Saga 2) and composed by Miko?aj Stroi?ski, who wrote the music for The Witcher 3 and The Vanishing of Ethan Carter. Bee Simulator features three modes, one of which will allow a sort of “freeplay” that showcases the tranquil qualities of Flower that Rosi?ski wanted to recreate, harkening back to the many relaxing hours he used to spend playing the game after long days at work. There’s a single player, story-driven campaign, a split-screen local multiplayer mode and a mode called free flight, where the player can fly around a Central Park-inspired location, and explore it at their own pace while racking up collectibles and achievements. The format allows the game to address both the educational and the relaxing qualities of Bee Simulator, while separating them just enough that the more leisurely aspects can be enjoyed on their own. The entomology nerd in me really appreciates the game’s attention to detail. One of my favorite books as a kid was a giant, intricate pop-up book of a bee, full of complicated folds revealing each of the insect’s marvelously intricately evolved parts. 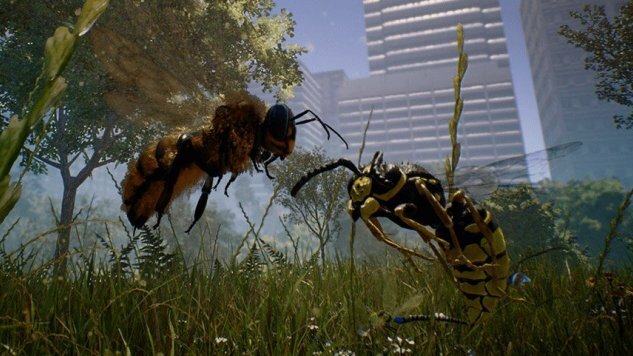 Bee Simulator reminds me of the fascination and wonder I felt every time I opened those pages, its use of accurate scale imbuing a sense of vulnerability that makes it easy to imagine how big the world would really be if you were a bee. In the demo I explored a giant hive, buzzing my way through cavernous passageways connecting its many rooms and sections to visit the worker bees. I meandered through brightly colored rings to collect pollen from flowers and deposit honey on giant hanging nests, triggering the bee’s special vision to highlight and collect his preferred flora. I engaged in territory battles with other bees, using impeccable timing on a hit meter to headbutt my way to victory. And throughout, Rosi?ski explained how the team’s passion for educating their audience on the life of the endangered bee provided a framework that gave them everything they needed to create a virtual experience that would both inform, but also entertain. In a stroke of thoughtful genius, Bee Simulator has two different difficulty modes for adults and children, so that the curiosity of the younger audience can be indulged, while the game still provides something for those who are more cognitively advanced. Fittingly, as I worked my way through the demo, some young boys, no older than four, started to play on the machine next to me, and they seemed enthralled; Rosi?ski tells me that Bee Simulator has been a hit with kids, with one child playing for over an hour on the first day of PAX. Bee Simulator will release on PlayStation 4, Xbox One, PC and the Nintendo Switch sometime this fall.